HERE is a Barnes & Noble Bestseller!!! In preparation of the release of THERE on December 24, I decided to mark HERE down from $3.99 and put it on sale for $0.99 for Black Friday weekend. When the sale started, HERE sold well on Amazon, but performed much better on Barnes & Noble than I expected. On Thanksgiving night, HERE was ranked #24,745. By Friday night, HERE had climbed to #521, and I was beyond thrilled. HERE had never done that well on B&N. By Monday night, the night the sale was supposed to end, HERE was still climbing the B&N charts, finishing the day off at #244. I had a thiry+ blogger cover revel planned for THERE on Wednesday, so I decided to leave HERE on sale until Friday night and see what happened. By Thursday night, HERE was flirting with the Top 100, ranking at #108. I was in shock, but waiting for the slide back to begin. It seemed impossible to think HERE could break into the top. Around 3:00 a.m. Friday morning, HERE hit #99. I was ecstatic! I did it! THE TOP 100!!!! CHOSEN has broken into Amazon’s Top 100 twice. The first time it dipped in, getting to #81, then fell out two days later. Honestly, I expected the same thing to happen with HERE. Except it didn’t. If anything, it picked up momentum. My next dream was to break into the Top 50. It seemed crazy. At midnight Friday night, HERE was #28. Could I break into the Top 20? Honestly, I didn’t dare to hope for it. HERE came out of nowhere, even though it’s been published for a little over a year. It hasn’t performed badly– HERE had sold over 15,000 copies since its release before the sale– but it’s never had sales like this. I kept expecting to hit refresh and find out it was all a huge mistake, and that my book fell off the charts back into obscurity. Saturday afternoon, it ranked #18. All Sunday, I kept waiting for HERE to start falling in sales after it reached #12. When I went to bed, HERE was #13. This afternoon I found a post on my Facebook Timeline. Part of the thrill of climbing this high (for me anyway, because I’m kind of a dork.) 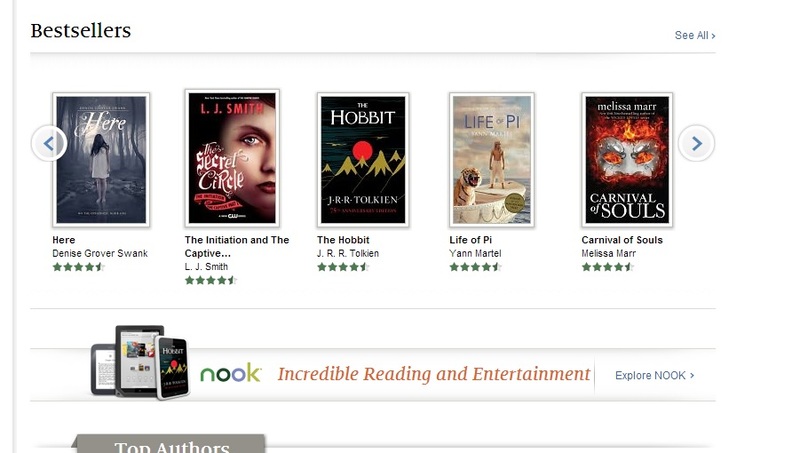 is that your book gets featured on the B&N Nook pages! On Saturday afternoon, my “dare to dream” goal was to reach the Top 15 so I could make it on the Nook Bestseller carousel, even if you had to scroll two passes to see it. No clicking through to see the top bestsellers on the Teen Nook page. HERE is the #1 bestselling YA book for Nook! Now, I may click refresh in two minutes, and HERE may have fallen into obscurity again. And you know, if it does, I’ll be okay with that. I never, EVER, expected to do this well. Hope? Dream? Of course. But expect? No. The thing is, I love this book. I wrote HERE for my then thirteen-year-old daughter who begged me to write a book she and her friends could read. Her only requests were that I name the main character after her– Julia–and that the book have a love triangle. When I finished, she formed a book club with several other eighth grade girls to beta read. Watching my daughter and her friends break into an mini-argument over Team Evan or Team Reece was exciting. They were fighting over characters that I created. When an author writes a book his or her goal is for people to read it. I think I got my wish. Congratulations! This is huge and absolutely fantastic, and of course well-deserved. It is a fantastic book and I’m not at all surprised to see it climbing the charts. Congratulations!!! I’ve had HERE on my kindle for a while now and finally had time to read it on my flight home for thanksgiving and enjoyed it so much I searched for more of your books and have since started The Chosen series and love that also. Congratulations on your success and thank you for sharing your joys with your readers! Oh Denise! This is just the best news ever!!! I’m so excited foryyoand beyond stoked to be part of team Swank!!! Haha. 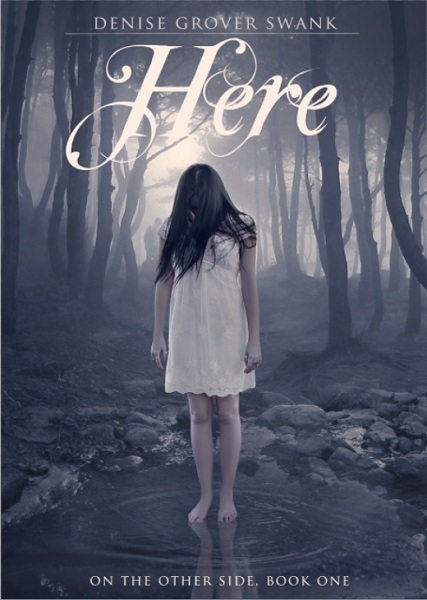 I recently purchased your NookBook ‘Here’ and I could not put it down. Can’t wait till late December for ‘There’. Congratulations! I’m glad that HERE is getting the attention that it deserves. It’s such an original story and a great read. I’m looking forward to reading THERE as I just placed my order for a limited time only autographed copy! I got it, Rowena! I’m so glad you liked HERE!